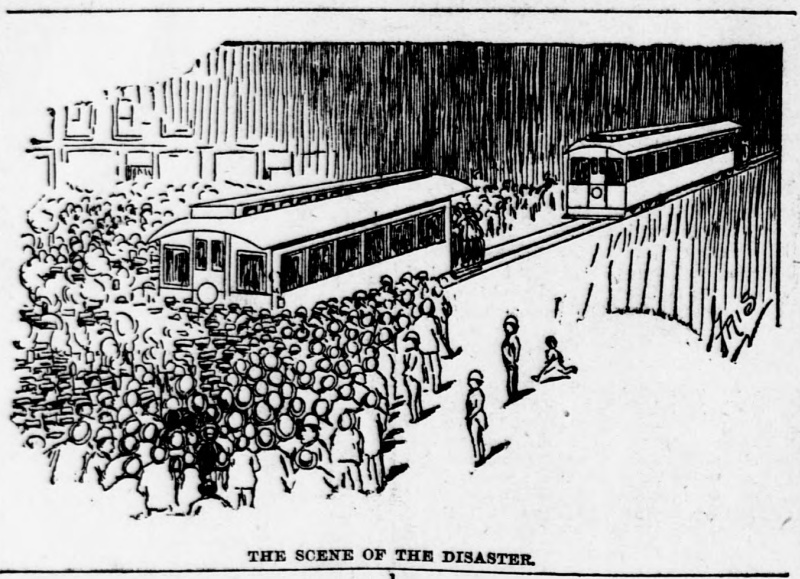 These article, from The Pittsburg Dispatch, describe an 1892 accident when two cars of Pittsburgh's Central Traction Company ran into a political parade. From The Pittsburg Dispatch / Sunday, October 16, 1892. One Is Killed Instantly and Another Dies a Few Hours Afterward. SEVEN BADLY HURT AND CARRIED HOME. Many More Are Slightly Injured, but Are Able to Hobble Away Without Assistance. THREATS OF LYNCHING MADE AGAINST GRIPMEN. Sorrowful Scene in the Morgue Deadhouse Around the Body of Young Henry Abel. Ward Euffner Had Both Legs Crushed and Died at the Homeopathic Hospital at 11 O'clock Last Night -- Terrible Accident to the Eleventh Ward Republican Club and the American National Band -- Two Cable Cars Unable to Stop on the Heavy Grade on Wylie Avenue -- A Maddened Crowd Threaten the Lives of the Crews -- The Disaster as Seen by Eye witnesses -- The Roster of the Dead and Injured. Two men killed and seven injured was the result of a terrible street car accident last night. This occurred on Wylie avenue when the Eleventh Ward Republican Club and the Michael Downey Club, of the Thirteenth ward, were marching down the avenue to join in the Republican demonstration. The disaster occurred between Fulton and Townsend streets. This is the steepest place on the hill The marchers were coming gaily down the avenue, led by the American National Band. The streets were lined with people cheering and applauding the boys. They were marching in the middle of the street and the music was loud and lively. No one gave a thought to the street cars, and when No. 61 came creeping down the hillside, the noise of the marchers and the band drowned the ringing of the alarm gong. Plowing Through the Marchers' Ranks. No. 04 is said to have stopped at Fulton street. It was then close in the rear of the marchers and they commenced getting off the tracks. The car was again started on its downward journey, making a swath through the young Republicans. Loudly the band played and those within sound of it did not hear the car. It is said that Gripman Gledhill tried hard to stop his car, but the brakes would not work. On it came, and the next instant the car was ploughing into the marchers' ranks. In less than a second two people were under the wheels, while seven more were thrown aside badly injured. The car ran ten feet further and then Gledhill got it under control. For a moment there was an awful calm. Then, like a thunder clap, there came a series of shrieks and moans from the horror stricken mass of humanity, which could be heard half a mile away. There were a thousandpeople there and everyone of them lifted up his voice in horror. The face of Gledhill was as white as marble. Threatened to Lynch the Gripman. The maddened, howling mob commenced to surround his car with crys of "Lynch him!" "Shoot him!" The gripman made a dash and was off his car into the mass. Men were knocking others over in their eagerness to get at him, but he escaped. While this was going on 100 strong men were trying to run the car back to get the imprisoned injured from under the wheels. Back of the car the marchers were standing with their lighted torches. The mass shut from view car 64. Car No. 51 was coming down the hill It was signaled to stop at Crawford and Gripman Steven Richardson tried his hardest to put the brakes on. Crawford was past, Fulton too, but still car 51 went on. Sand was poured like water on the tracks, but the brake would not catch. On it came, the crowd with screams and oaths pressing back, giving it room to pass. The next instant there came a crash, and car 51 had collided with No. 64. This was the blow which did the fatal work. The collision shot the front car several feet ahead, crushing out the remaining life of one victim and cutting botn legs off the other. A Terrible Scene After the Accident. The scene was then indescribable. For two squares each way the street was filled with a struggling, shrieking, moaning, crying sea of humanity. There was an oath from one, a prayer from another, Awhile a thousand frenzied shrieks rent the night air. Those who were less frantic went to work to get Ward Ruffner from under the wheels, where he was tightly wedged. Young Abel was dead, but Ruffner was still alive. After considerable work he was released. The Homeopathic ambulance and patrol wagon were summoned, and the dead and injured taken away. HENRY ABEL, instantly killed aged 15. He lived on Jacobus alley. WARD RUFNER, aged 18 years, lives at No. 534 Wylie avenue, had both legs crushed and hurt internally. He was taken to the Homeopathic Hospital, where he died at 11 o'clock. HENRY SNITZER, aged 35 years, of 106 Second avenue. He is a clarinet player in the band. Was thrown under the car and badly injured in legs and shoulder. FRANK W. ZILLNER, aged 22 years, of 92 Clark street. Had his heel crushed and badly bruised. JOSEPH MANGOLD, Jr,, aged 28 years, of 50 Long alley, Allegheny, a cornet player In the band; had his hip crushed and side bruised. JOHN McILVEEN, aged 17 years, of Watt street. He was hurt in the side; not seriously. JOSEPH McILVEEN, aged 19 years, of Watt street. He was struck by a car and slightly injured. ROBERT K. GINNIFF, aged 17 years, of 128 Erin street. He was struck in the back and badly hurt. ALBERT KIRK, aged 26 years, of 29 Reed street. He was playlng the bass drum in the band. Was hit on the leg and badly injured. Attacked the Crews of the Cars. During the work of rescue Conductor F.O. Shonert, of 64, and Gripman Richardson, of car 51, were having a hard time with the crowd. Richardson stayed in his car. The mob gathered around it and stones and torches were thrown through the windows. He tried to explain to the people that he had done all in his power to stay the car, and finally the attack stopped. His conductor was tackled in the rear. Three burly colored men boarded and swore they would have his life, but some of the passengers interfered. Conductor Shonert was assaulted several times,but was uninjured. Finally the two cars were moved down the hill. The avenue still remained crowded. At the scene of the accident it was strewn with torches, still burning, and here and there one of the marcher's caps was laying. Running hither and thither were the paraders, trying to learn who was dead and injured. All of them were wild with excitement and were loudly denouncing the street car employes. At last the remaining victims were taken away and the crowd began to disperse. The street was still crowded, however, when the headlight of car 54 came into view down the hill. "There it comes!" "There it comes!" were the cries of the mob. As it came up through the crowds groans and hisses arose on every side and an occasional stone was thrown. It finally got through the mob, but the whole way out to the car barn insulting epithets were hurled at the crew. Car 51 was treated in the same way, but no one was injured. The Hill district was thrown into a state of excitement by this accident, which it will take some time to recover from. Late last night the thoroughfare was still crowded and the one topic was the awful disaster. The general opinion was that the gripmen were to blame. His Widowed Mother Watches Death Claim Her Darling Boy. Patrol wagon No. 2 was answering a call near the scene of the accident. As soon as the officers heard the screams of the spectators they gave their prisoner to the care of another officer and hurried to the scene. The first man they cared for was Ward Ruffner. They placed him in the wagon and conveyed him to the Homeopathic Hospital. Ruffner is about 18 years of age, and was the son of Mrs. James Dale by her first husband. The case is a particularly sad one. About six months ago Mrs. Dale visited her mother in a small Ohio town. Shortly after her arrival she received a letter from home stating that her husband was ill. She had hardly time to get ready to return home until a telegram announced the death of her husband. With sorrow-stricken heart she returned to the city and learned that ber husband had been taken ill suddenly and died at the Homeopathic Hospital. To-night she was again suddenly called to a deathbed at the same hospital. Ruffner was employed in W. G. Johnston's printing establishment and lived with his mother at 534 Wylie avenue. The hospital surgeons found the car had passed over both of Ruffner's legs above the knees, crusning tne bones. He died at 11 o'clock from the shock and hemorrhage caused by internal injuries. Ruffner was perfectly conscious when first taken to the hospital, and with remarkable coolness related the particulars of the accident. He said the parties working had him partially out from under the car and the car pushed back upon the track, when the second car thundered down and forced the wheels over his legs. Mrs. Ruffner, as soon as she heard of the accident, hurried down to her boy at the hospital and with a grief pitiful to behold, sat by the bedside until death relieved her darling from his awful suffering. They Are Locked Up, but Finally Released on Bail. When Gripman Gledhill escaped through the crowd Officer William Elmore gave chase. Gledhill went direct to his home on Ridge street, where he was arrested. The prisoner was brought to the Eleventh ward station. Gledhill said that the accident could not have been avoided. He said he applied his brakes, and when be found the car sliding he pulled the gong and shoved his head out the cab window and yelled for the marchers to get out of the road. He was very much agitated and could hardly speak. Gledhill has only been on the road one week. Later Steven Richardson, gripman on car 51, was arrested and locked up. Both prisoners were afterward released on a bond or $1,000 each, given by the Central Traction Company. The Coroner sanctioned the release of the men. The inquest in the case will be held Tuesday morning at 11 o'clock. The Mob Threatened to Burn Him if He Moved His Car. Car 56 was following 51 down the hill and its gripman came near getting into trouble. Roy Caldwell was a passenger on this ear. He says when Arthur street, three squares above the scene of the accident, was reached, a number of men surrounded the car. They made the gripman stop it. Several of them thrust their torches through the window and said thev would burn his face off if he dared to move the car. Gripman Meyers held his car for quite a while. Almost Rescued From Under the First Car When the Second Ran Into It -- The Collision Killed Him -- Pathetic Scene at the Morgue -- A Father's Grief. August Abel, the brother of Heny Abel, the boy who was killed, played the alto horn in the band which led the Eleventh Ward Club in its march of death. Upon leaving home last night Henry, who was but 14 years of age, asked his brother if he wanted him to go with him to hold the torch for him to see his music. August said it would be very convenient and he would like to have him come. So it was that his brother was by Henry's side when the latter fell under the deadly wheels. The car brushed past August knocking his hat off and his instrument out of his hands, but did not give him any injury. "I didn't hear the car coming at all. The first thing I knew was that the car struck me, knocking off my hat and almost felling me to the ground. Looked quickly around for my brother. I saw him under the car. A crowd of us got to work and succeeded in pushing ibe car off my brother and another man who was under it, when, without any warning, a second car plunged into the first, causing it to run again over my poor brother. When we pushed the first car off him, before the second car came, my brother seemed all right. It was the second car that caused his death, for I think he would have recovered had we been able to rescue him before the collision." At this point there was a violent knocking on the glass of the morgue door. The face of an excited man was peering anxiously through the glass, crying "Let me in, let me in!" It was Henry Abel, father of the dead boy. When he entered he cried out; "I want to see my boy!" Upon looking at the body he broke down completely, and all the efforts of his two sons to comfort him were unavailing. He talked away In German to his sons bewailing his misfortune, and became so excited that It took the combined efforts of five men to quiet him down. The body of Abel will be removed to his father's home on Duff street this morning. The Gripman. Could Not Apparently Control the Car -- Ran Past the Crossing -- Threats Made Against Him -- Many Narrowly Escaped Injury. W. H. Burke, who was on car No. 64 when the accident occurred, was seen afterward, and said "I think the gripman must have been a new hand, as he could not control his car. What makes me believe this is that I, with a number of others, were waiting on the hill above at Arthur street to get on the car. The street here is almost level and there should have been no trouble in stopping at the right place. Instead of that he ran nearly half a square before the car was stopped. When he was coming down the hill the same trouble was apparently experienced at Fulton street, and at no time did he seem to have control of his charge. The car was packed at the time, and, as the grade is very steep here, it made it all the more dangerous. "I was standing on the rear of the car, and on hearing the excitement incident to the marching along of the club, I leaned over the side of the car and saw some of the members of the club separate, but no attention was apparently paid to it by those in front. The people were shouting, while the band was playing. These together made a terrible noise, and those in front must not have heard the oncoming car. "As soon as the accident happened the street was crowded with people. No opportunity was given to get oui those under tne wheels, as the people were jammed up to the very sides of the car. While working as best they could another car came down and ran into the rear end of 64, This made the people wild, and many threats were heard against the gripmen of both cars. I believe it would have taken little to have caused trouble there and then. "The only wonder to me is that there were not many more hurt. When the car first ran into the club the members were knocked about on all sides. I can't understand how so few were injured. That car simply plowed through those people. It was the worst sight I ever saw, and I never want to see another of the kind, much less pass through it again." They Claim That It Was Impossible to Stop the Car. "We were coming slowly down the hill," said Conductor F. O. Shonert, of car 64, "and some distance ahead I could see the marchers. My gripman, Gledhill, is a new man, and this is the first time I ever worked with him. I noticed that as soon as he saw the parade he commenced slowing up. As we approached the crowd Gledhill seemed to be putting forth all his strength in stopping the car. The brakes refused to work for some reason and the rest is known. I have three reliable witnesses who will swear that Gledhill sounded his alarm numerous times. I had 48 passengers on my car. There was an ordinary load. When they saw thee impending danger there was almost a panic. Many of them jumped off. I do no think any of them were injured. Stephen Richardson, gripman on 51, had this to say: "When I came to Crawford street. I saw there was something the matter. This is a square and a half away. I at once commenced to put on the brakes and apply the sand. I could not see what was the matter: the wall of torch bearers shut from my view the first car. I tried my hardest to stop my car, but couldn't. The place where the accident occurred was the steepest point on the hill. and why the brakes would not work I cannot understand. I do not think that the first car was shoved more than three feet." There were over 50 people on this car. Many of them were standing and when the collision came they were thrown to the floor. From The Pittsburg Dispatch / Monday, October 17, 1892. Trouble Found in Settling the Responsibility in the Wylie Avenue Case. A Rumor That There Was Oil on the Track Is Exploded. THE COMPANY'S SIDE OF THE CASE. Hundreds of People Visit the Morgue to See Young Apel. Where to place the blame in the Wylie avenue street car accident Saturday night is going to be a hard task. No two men tell the same story. One man is willing to swear that he saw the gripmen do their best to stop the cars, while the next man who is spoken to will say that no effort was made to check the cars. This state of affairs has caused Coroner McDowell to postpone the inquest until Wednesday afternoon at 2 o'clock. The case is so complicated that the Coroner wants to thoroughly investigate it before the hearing. The sensational story that oil was poured on the tracks by a small boy has been exploded. It was thoroughly investigated by Coroner's Clerk Brush yesterday afternoon. He, accompanied by a DISPATCH reporter and Superintendent Smith, visited the scene of the wreck. The tracks were closely examined and there was no sign of oil. It was learned from bystanders that a boy had been seen runuing in front of the parade trailing a broken torch along the rails. The people said that Lieutenant Scott, of the Police Department, had set the oil on fire after the accident and burned it off. Mr. Scott could not be found in the afternoon, but the parties called on the members of the band who had marched in the front rank. They all denied the story and said that no one had been in front ot them coming down the avenue. Lieutenant Scott was found last night. He had not burned any oil on the track, nor had he seen any evidence of any or even heard that there had been oil ou the tracks. Superintendent W. C. Smith, of the Central Traction Company, had this to say about the disaster: "The accident, from all that I can learn, was purely unavoidable. The men certainly did all in their power to stop the cars. That slope is the most dangerous place we have on the road. This is not the first time there has been trouble in stopping cars there. The cars have often slipped the length of themselves on that hill Both 61 and 51 had heavy loads on Saturday night. It is an unusual thing to come down with crowded cars. The travel is usually scattered on the down trips. A New Man on the Road. "I have been told that Gripman Gledhill, of car 64, had his car nearly stopped at Fulton street for some reason. He is a new man on the road, but has been doing very good work, The fellow seemed to understand his duty. It is said that he swore at Ihe crowd at Fulton street. I do not think this is true. This happens sometimes between gripmen and teamsters, but there was no fight Saturday night between my men and the marchers. Gledhill had come down through their lines for a couple of squares aud had no trouble. Coming down the hill he only had his grip on a short way. The car was running itself. Richardson, the gripman on car 51, is the oldest employe of tne company, and until Saturday night never had an accident. He certainly did all he could to stop his car, but he had a heavier load than Gledhill. Ihe brakes on both the cars are as good as they can be. This is evidenced by the fact that the wheels were sliding. "I was downtown when the accident occurred. I did not know that there was to he a parade on Wylie avenue or I would have been prepared for it. There are so few parades along the avenue that I think it best to let them have the right of way. Had I known of the parade I would have had a man stationed at the street where the marchers came onto Wylie and he would have regulated the running of the cars, I am working with the Coroner in this matter and I want a thorough investigation." Told by a Victim's Brother. "We raised car 64 and got Snitzer from under the cow-catcher. He was lying with his legs crossed. We had gotten him out, and were just raising the car to rescue my brother Henry when car 51 collided. Henry was under tne cow-catcher, with one leg sticking out when the collision occurred. The car ran entirely over him. I think he would not have died had it not been for the second accident." A Word for the Gripman. R. B. Cunningham saw the accident. He thinks Gledhill did all in his power to stop the car. He is positive that the wheels were locked, but they were slipping. Ex-Councilman Charles Hannam was another man who saw the accident. It occurred right in front of his door. "I saw the car coming down the hill at a rather rapid rate," said he. "I am certain that the gripman did not throw one of the levers back until he struck the matchers. I do not know whether it was the one which controls the brakes or the grip, but I then saw him pull back on it with all his force. When the car was finally stopped the front door was opened and Gledhill was standing in it. He threw up bis hands and exclaimed: 'My God, I could not stop the car.' The other car was then coming down the hill I saw what was going to happen aud not wishing to see the crash walked into my store." "I know Just what note I was playing when the accident occurred. The drum major at that time was facing down the avenue, and according to our music he would have to be facing the band just three seconds before that. I know he followed the music, and he says that he could not see any car coming around the curve at that time. This is a great deal faster than the cars usually run. The second car came down at almost the same rate. It was the one that did the fatal work. No one would have been killed had not the collision occurred." Superintendent Smith is feeling very badly over the accident. He was present yesterday when these interviews were given, but the parties did not know who he was. He felt the remarks made about the management of the road very keenly. Along tne streets the people were talking about the accident and scoring him severely. Once car 61 passed a young man Just as the investigating party came along. The car was spoken or In language not very choice. Mr. Smith remarked that he supposed both it and car 5l would be hoodooed. He said that sometime ago one of the cars ran over a colored boy and since then none of the colored people would ride on it. Henry Apel was kept at the morgue until 1 o'clock yesterday aiternoon. He was then removed to Beinhauer's udertaking rooms and later taken to his home on Jacobus alley. As soon as the doors of the morgue were opened yesterday morning the people commenced to flock in. It was estimated that over 1,200 people viewed the remains up until 1 o'clock. The curious were made up of all sorts of people. After the body was taken to the undertaker's many people called there. Even until late last night people were calling at the morgue to see the body. His remains were taken home about 3 o clock. They were encased in a neat white coffin, bearing the inscription "Our Dear Boy." The scene at the home was a very sad one. The mother could not he comforted. The funeral may take place tomorrow afternoon. At the home of Ward Rufner the scene was the saddest. His mother was wild with grief and the house was literally bathed In tears. Hundreds of people called during the day and but few of them departed with dry eyes. The young man was very popular. His remains will be interred in Homewood Cemetery this afternoon. One of the saddest things to the friends or both boys is that they haven't even a photograph of their dead. There was a rumor yesterday that a subscription would be raised to prosecute the Central Traction Company. It could not be verified. The injured were all reported yesterday to be getting along as well as could be expected. It is thought they will all recover. From The Pittsburg Dispatch / Wednesday, October 19, 1892. A Boys' Political Club Turns Out to Bury One of Their Number. Henry Apel, who was killed on Saturday evening at Wylie avenue and Fulton street, by a cable car running into a political procession was buried yesterday. The boy was 15 years old. He was carrying a torch for the band when the awful death over took him. The Thirteenth ward Junior Republican Club turned out in a body yesterday afternoon to attend the funeral of their dead member. Forty members of the organization attended. They carried a flag heavily draped and they marched in advance of the hearse four abreast. Tbe club was in command of Willie Petty and they gave to the doleful occasion an impressive air. From The Pittsburg Dispatch / Sunday, October 22, 1892. They Are Exonerated From Blame for the Disaster on Wylie Avenue. Held Upon the Bodies of Henry Apel and Ward Ruffner. To Give the Public Safety Department Control of Parades. As a result of the verdict rendered by the jury yesterday in the cable car accident on Wylie avenue last Saturday night, Coroner McDowell is preparing an ordinance to be presented at the next meeting of Councils regulating parades on the streets and requiring persons in charge of such turnouts to secure permission from the Department of Public Safety. The jury in its verdict on the deaths of Henry Apel and Ward Ruffner says: "from the evidence we find that it was accidental and exonerate Gripmen Gledhill and Richardson from all blame and further believe that if proper arrangements had been made with the Central Traction Company said accident could have been avoided. "We would further recommend that an ordinance be pased by Councils that for all demonstrations of any kind whatever the Department of Public Safety have charge of routes and make all arrangements for stopping cars, etc., for the better protection of life, limb and property of the community at large." A Crowd at the Inquest. The was a larce attendance at the inquest yesterday. Among the witnesses were the gripmen and conductors who ran the cable cars 51 and 64 down Wylie avenue on that fatal trip. John Spratt testified that, though not present at the time of the accident, he examined the tracks afterward for oil, but found none. He found that the Center avenue switch had been greased. Henry Gledhill, gripman on car 64, the one which first ran into the marchers, testified that his car was running along all right until he tried to stop at Tannehill street. When he saw the club ahead he threw off his grip, put on the brake and rang the bell. The first club turned off. He found the brake would not hold and threw it off and gripped the cable. Then seeing the danger ahead he released his hold upon the rope and put on the brake again, using sand. Seeing it was no use trying to stop he opened the window and yelled. A lieutenant of one ot the clubs yelled at him, "Stop that car." He yelled back, "My God! I can't stop!" "When he did finally get the car stopped he assisted in pushing it back off young Henry Apel, but when car No. 51 ran into his car he hurriedly took off his cap and badge and started home, intending to go to a police station and give himself up. A policeman was waiting for him when he got home. Gledhill said his brakes had previously held all right on the hill. The Wheels Slid on the Rails. Steven Richardson, gripman of No. 51, testified: "I first saw the clubs ahead at Crawford street. Such a heavy smoke arose from their torches I could not see the car below them. "When I got close enough, saw the crowd on the track I put on the brakes and opened the sand pipes, but before I reached Fulton street the wheels were blocked and sliding. I could do no more. I have been on the road two years and this was my first accident. The hill at Fulton street is the worst place to stop on the road. Both the sand boxes on my car were wonting freely." F. O. Shonert, conductor on car No. 64, said there were 54 persons on the car. His evidence corroborated that of Gledhill. Conductor Pimm's evidence, of car 51, was also corroborative. W. T. Taggart and John Spratt testified to examining the tracks after the accident There was plenty of sand on the rails from Townsend to Fulton streets, but none above except in a few spots. Where the Fulton street electric line switch is the rails were greased. Daniel Crowley, the drum major who led the procession down the hill, testified to the orders he had received. Just belore the accident he heard Captain Brown's whistle. It meant "look out for cars." Just as he looked back he saw the cable car plowing through the company. It was Crowley's first night out as drum major. His orders were to keen a lookout for cars, but his view was obstructed. The testimony of several members of the club corroborated Crowley as to hearing Captain Brown's whistle. Superintendent Smith, of the Central Traction Company, testified to reliability of the crews on the two cars. On the stand he stated that the company bad received no notice there would be a turnout or some preparations for safety would nave been made. Mr. Smith stated his purpose of asking Chief Brown to notify the company in the future of any expected parade, and when so notified he would make arrange ments so such accidents will be impossible. In his address to the jury the Coroner strove to impress the members with the deep responsibility resting on them. The law of city and State, he said, gives the street railway companies the right to traverse the streets over which their charters give them rights, unmolested by any person, but with due regard to the safety of the public. Cautioning the jurors against being influenced by any comments they may have heard or read in regard to the accident under consideration, the Coroner continued: "I would suggest that you treat the question of an arrangement for demonstrations upon the highways of the county, as since this sad accident another similar one has been chronicled in our midst. This, of course, you are not to consider further than as I call your attention to it. But the time has arrived when some specific arrangement should be made by which the life and limb of the pedestrian upon the streets, as well as the traveling public upon the cars of the traction companies should be protected, and through some authority other than the assumed authority that we are daily called upon to notice by the various organizations and associations that traverse our streets. "I would suggest that you take the question into consideration of a proper ordinance or ordinauces being passed by the Councils of the two cities by which an arrangement for all demonstrations of every kind should be made with the Departments of Public Safety so that full protection could be afforded to the citizens and passengers upon the cars during such demonstrations. "You will see, gentlemen, that you have the right and it is your duty to present in your finding what disposition should be made of the gripmen in charge of cars 64 and 51, as appears from the testimony. "Whether or not their actions were such upon the night of the accident as careful, prudent and careful men. If they were, you have the right to say whether you exonerate said motorman from any blame. If you believe that the action of either or both was tardy, derelict or without due caution which men in their positions should exercise, then you should so find, so that the matter may be properly certified to the grand jury, and that they may be dealt with according to law." "
After his charge to the jury the coroner submitted to them a copy of an opinion handed down bv Judge Green, of the Supreme Court, in the suit for damages of Carson vs the Federal Street and Pleasant Valley Passenger Railway Company in January last. One of Carson's wagons was driven on the company's tracks and was struck by a car, the driver not having looked nor stopped to see if a car was coming. A Decision by Justice Green. In reversing the lower court and denying the claim, Justice Green points out the law as to the rights of railway, companies "The street railway," he says, "has become a business necessity in all great cities. Greater and better facilities and a higher rate of speed are being constantly demanded. The movement of cars by cable or electricity along crowded streets is attended with danger and renders a higher measure of care necessary, both on the part of the street railways and those using the streets in the ordinary manner. It is the duty of the railway companies to be watchful and attentive and to use all reasonable precautions to give notice of their approach to crossings and all places of danger. Their failure to exercise the care which the rate of speed and the condition of the street demand is negligence. On the other hand, new appliances, rendered necessary by the advance in business and population in a given city, impose new duties on the public. "The street railway company has a right to the use of its track, subject to the right of crossing by the public at street intersections; and one approaching such a place of crossing must take notice of it and exercise a reasonable measure of care to avoid contact with a moving car. It may not be necessary to stop on approaching such a crossing, for the rate of speed of the most rapid of these surface cars is ordinarily from six to nine miles an hour; but it is necessary to look before driving on the track. Must Not Run Into Danger. "If, by looking, the plaintiff could have seen and so avoided an approaching train, and this appears from his own evidence, he may be properly non suited. It is vain for a man to say he looked and listened who walks directly in front ot a moving locomotive. The jnry occupied nearly an hour in reaching the verdict. "When it was announced, the Coroner dismissed the cable car man, who had been held under bail since the accident. Relative to the ordinance he intends to introduce, the Coroner last night said: "I have talked with Chief Brown about it, and he agrees with me. It will not be the purpose of the bill to interfere with the rights of any American citizen, but to provide for the safety of the public. My idea is that the matter be placed in the hands of the Public Safety Department, to whom any organization desiring to parade must apply for a permit, giving the entire route, the time of parade and number of men to be in line. "With such an understanding, accidents could be entirely avoided. As it is now, the street car companies can't provide against accidents, because they don't know anything about them until their cars meet them on the streets."